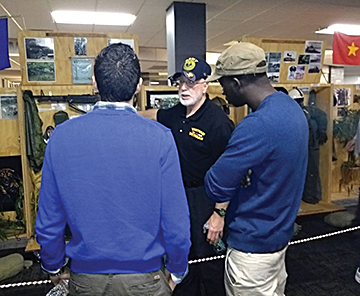 Before there was an Appleton, Wisconsin, Chapter 351 educational program—before there was a Chapter 351—Leon Meidam was talking to students at Hortonville High School about the Vietnam War. At the time, Meidam had a child in the school, and a teacher asked him to come talk to the kids about the war. Thus began a signature program of veterans talking to students. It was a small start: tables with backpacks, C rations, and other artifacts from the Vietnam War, all with hand-printed labels. Meidam, who later became Chapter 351’s president, presented the program in five schools, then ran it for ten years. In those early days, though, it wasn’t unusual to have as many as twenty veterans talk. Discipline was loose, parameters hadn’t been set, and results were unpredictable. Presentations were also labor-intensive. Dummy grenades, uniforms, tables, and all other equipment and artifacts had to be transported and displayed by hand, one by one. Then Bruce Levenets stepped in. He was an old hand at setting up programs and presentations for Rangers and Boy Scouts. Levenets expanded the program and wrote its first guidelines. By then, Chapter 351 had formed, though in the early days it nearly died. Meidam wanted to keep the chapter running, including the school program. In this, too, he was successful despite some local antipathy toward the Vietnam War and its veterans. In one school, eighty-some parents kept their kids home when a chapter presentation was scheduled. 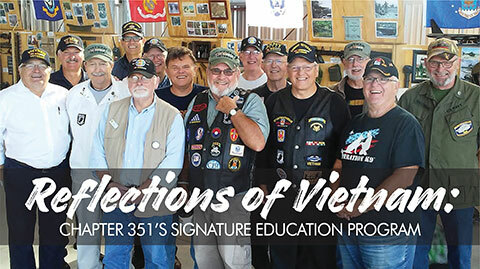 Today, the Chapter 351 educational program—called Reflections of Vietnam—has been running for six years and has completed more than a hundred successful “program missions.” Chapter members speak to fifteen to twenty high schools a year, as well as universities and technical colleges. It is a program known throughout the state and beyond. Some schools are three hundred miles from Appleton. John Koehler, the chapter Vice President and Education Coordinator, says the guys like the road trips. “Success breeds success,” he quipped. Open communication and teamwork are key to the program’s success. The schools are fully informed about what the chapter does and how they do it. Koehler and other Chapter 351 members send emails outlining the program to school authorities, including principals, student body presidents, student activity offices, and teachers. All are involved, as are students, school groups, and everyone in the chapter—especially those who will be in the schools. If the school is small, local media may be invited, too. It is very much a community effort. Chapter 351 members speak mostly to high schools, mainly to juniors and seniors. But presentations also have been made at private schools, charter schools, technical colleges, during military events, and more. At one Catholic school they addressed more than five hundred students. Technical colleges have unique challenges, as student ages can range from eighteen to forty. Chapter 351 makes between fifteen and twenty Reflections of Vietnam presentations annually. “This means an overabundance of logistics. But it’s not beneficial to promise something you can’t deliver, so the number of programs run by the chapter should reflect what the members are willing and able to accomplish,” Koehler said. In most schools the veterans arrive as strangers to both students and school officials. The first step is to establish trust. Although it is easy to disparage kids—his pants hang too low, she has too many piercings, he has too many tattoos—chapter members must respect every student. They never try to discipline a student for any reason. Instead, they report disruptive or inappropriate actions to the school staff and let them take care of it. Since the program’s earliest days, artifacts have been taken to the schools. Travel is hard on these irreplaceable objects, however, so Leon Meidam and some other members designed and built several six-foot-high wooden lockers on wheels to safely transport them. Most displays are set up in school auditoriums or gyms. It takes about one hundred feet of table space to hold the artifacts contained in the lockers. Display set-up takes about forty-five minutes. Included in the display are in-country photos of chapter members. Students seem to like to compare members now to the way they looked during the war. “We’ve got what we feel is the largest mobile museum of Vietnam artifacts in Wisconsin,” Koehler said. Weapons in schools can cause deep anxiety. One school denied access because of the weapons, but most school employees and students relax under the professionalism of the veterans. Barriers are set up between the students and the equipment. All weapons are disabled and accounted for. Some are dummies or replicas; still, every piece is checked. The members sign off on scrupulously maintained inventories. During the program, veterans guard equipment even while they answer staff and student questions. For each Reflections of Vietnam presentation there is a moderator, four speakers, and any number of veterans answering questions or just along for the experience. The moderator and the speakers sit on stools before the audience. They follow a strict but easy-going format. The moderator makes introductions and gives some background on the chapter in five minutes. Following the moderator’s opening remarks, the program is broken into three rounds. Round One: Presenters introduce themselves, their branch of service, what they did in the war, and where they served. This takes no more than three to five minutes for each presenter. Round Two: Presenters recount a story from a list of topics or they can choose their own. These, too, are three to four minutes each. Afterward, the moderator asks for questions from the audience. Questions are addressed as efficiently as possible, and the responses usually take from two to three minutes. Round Three: Each presenter has three to four minutes to talk about a second topic of his or her choice. It can be anything from mail call to what they missed most. Once again, the presenters field questions from the students. Then the moderator wraps up the presentation in about five minutes and thanks the school, the audience, and everyone who participated. Moderators must be willing to direct others and have experience in organization. They have many jobs. They check the sound system and displays. They review protocol with presenters. They are responsible for keeping speakers on point and within strict time limits. They schedule speakers and drivers, get school contacts, find physical buildings, and decide how to set things up. They ask for feedback from staff and students after every presentation. “They own the day,” according to Koehler. Chapter 351 currently has eight moderators. They talk among themselves, as well as with participants in other programs across the country, to exchange ideas and suggestions to keep their programs fresh. First, a few guidelines. The Chapter 351 educational program imposes strict time limits on its presenters: Talking longer than four or five minutes will guarantee the loss of your audience, and you may hear snoring. Too many dates, military units, battle details, and other minutiae bore students. No free-for-all talk, no angry politics, no rants, and no long digressions are permitted. Every talk is from the heart, but every talk is disciplined. And presenters shouldn’t be upset if no one asks questions. Most in the audience will not know enough to ask questions, or they may be shy or intimidated. To alleviate such situations, the moderators let students know they will be willing—even honored—to take questions one on one after the presentation. In the beginning, before guidelines were developed, one veteran began talking about Jane Fonda and sputtered in anger for a very long time. The students didn’t even know who she was or why the man was venting. These digressions are a sure way to lose your audience. The current format allows each man to tell two stories in three to five minutes each. The moderator gives a sign when time is up. Speakers may choose to talk about things like How I Got a Purple Heart or How I’m Lucky to be Alive. They may talk about Agent Orange, unexploded ordinance, and PTSD, being careful to avoid graphic detail. Sometimes they try to explain the Vietnamese jungle, the fog, getting sick, appendicitis, and leeches. They describe trench foot, spiders, and pythons. It helps to have speakers from each branch of service as their perspectives are different. Koehler says he’s never had a student bring up things like My Lai. Presenters don’t, either. Students are likely to ask about widely known subjects, such as Agent Orange, PTSD, and the experiences of coming home. Many want to talk about the politics of the Vietnam War. Chapter 351’s Reflections program is designed to accommodate presenters as well as students. 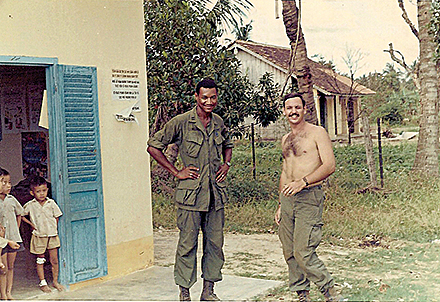 Many returned from Vietnam with PTSD, which generates anxiety. But speaking in a controlled environment with known parameters can keep anxiety at bay. It’s an environment shared with others who know what you’ve been through. PTSD can also interfere with the ability to concentrate, which means it’s easy to roam off point. 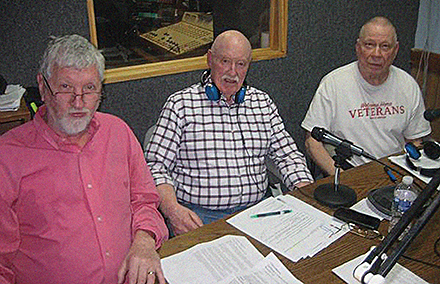 The program’s strict time limits keep rants and rambling in check. For many, the structure is very important. For those afflicted by depression, the program offers camaraderie, and its clear direction and support help heal many things, including lack of motivation and interest. Those in Chapter 351’s education program urge other veterans to go to the schools with them just to watch. They don’t have to speak; just be there. Many of those members later decide to speak themselves, and with a little coaching they find that they are good at it. “It all comes from the heart,” said Koehler. Students embrace the stories. In the main, they are respectful, awed at times, interested, and intelligent. At the program’s conclusion, students often hug the speakers. The talks are a shared experience, very different from reading about a war in a textbook. Often, too, students and staff send thank-you notes. It’s not unusual for presenters to receive forty or fifty notes from students. The chapter recently has encouraged spouses, families, and friends of chapter members to attend these programs. Similarly, they welcome veterans from the wars in Iran and Afghanistan to participate. Every chapter event is also an opportunity to promote the education program. And they are eager to network with other chapters across the country.